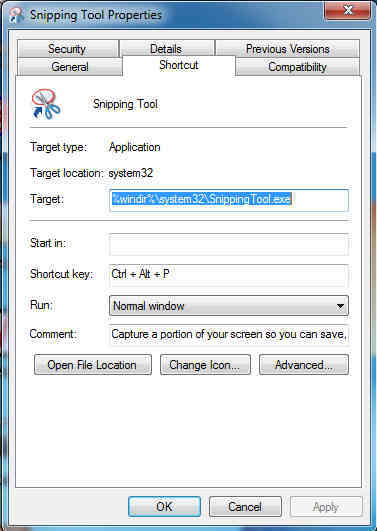 On Windows 7 we need to open the Snipping Tool and there are several ways to do this. Using the Windows menus we select Start → All Programs → Accessories and the Snipping Tool appears under the Accessories folder. The tool can also be opened by clicking on Start and then typing Snipping Tool followed by Enter in the Search box. 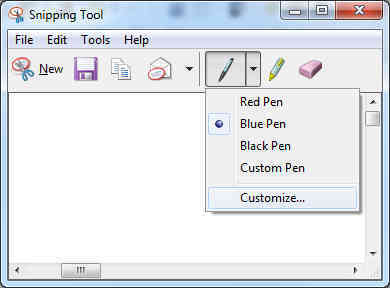 In Windows 8 open the Snipping Tool by swiping in from the right edge of the screen, tapping Search (or if you are using a mouse, pointing to the upper right corner of the screen, moving the mouse pointer down, and then clicking Search), enter Snipping Tool in the search box, tapping or clicking Apps, and then tapping or clicking Snipping Tool. If you can not find the program, press the Windows key, type Programs and Features, and press Enter. The Programs and Features control panel applet will now open. Click “Turn Windows Features On or Off” in the left pane and then click through the User Account Control dialog Box, if necessary. Check Tablet PC Optional Components, click OK, and then close the Programs and Features applet. 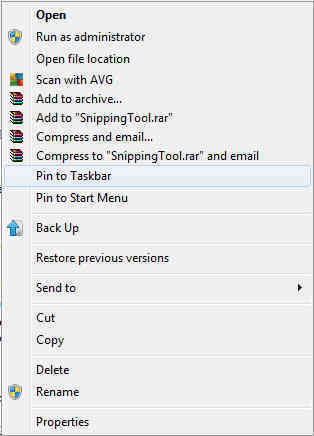 If you wish to pin the tool to the Taskbar then right click the program name Snipping Tool and select Pin to Taskbar. Right click on the program name Snipping Tool and then select Send to → Desktop to create a shortcut on the desktop. You now have handy access to this tool at any time. If you are a little more adventurous you can also create a Shortcut for the Snipping Tool. Right click the program name Snipping Tool or its shortcut and select Properties. A window will pop up, click in the Shortcut key box under the Shortcut tab. Enter your chosen key combination (CTRL-ALT-P is popular) directly by clicking on the keys you want to have as shortcut keys and then click OK or Apply. In the Snipping Tool, tap or click the arrow next to the New button, choose the kind of snip you want, and then pick the area of your screen that you want to capture. 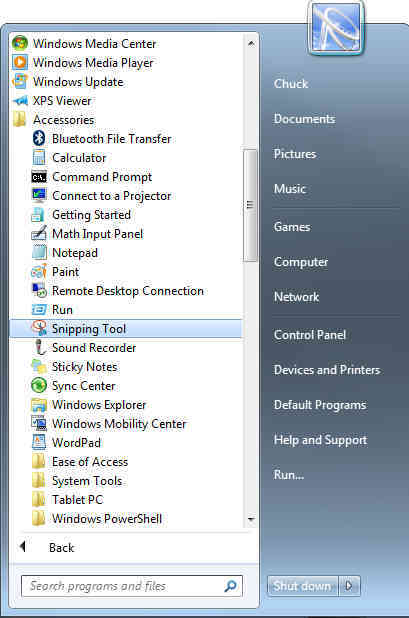 The snip is automatically copied to the Snipping Tool window. You can copy the snip from the snipping tool to the clipboard by just clicking on the Copy icon in the Snipping Tool workspace when it is open. Free-form Snip. Draw any shape around an object with your finger (Windows 8), mouse or tablet pen. Rectangular Snip. Drag the cursor around the object to form a rectangle. Window Snip. Choose a window – like a browser window or a dialog box. You can capture a snip of a menu by doing the following. After you open the Snipping Tool, press Esc, and then open the menu that you want a picture of. Press CTRL + PrtScn. Tap or click the arrow next to the New button. Choose the kind of snip you want, and then pick the area of the screen you want to capture. When you capture a snip from a browser window and save it as an HTML file, the URL appears below the snip. To remove it: Tap or click Tools, and then tap or click Options. 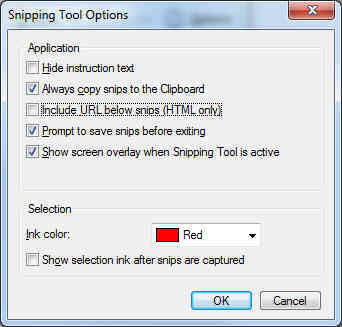 In the Snipping Tools Options dialog box, clear the Include URL below snips (HTML only) check box, and then tap or click OK. The Snipping Tool has the ability to mark up the Snipped image. This means you can create just about anything on the image such as a circle around content, or an arrow pointing to the content. Markup is limited, so if more professional markup is desired then you can use the Open Source program GIMP. Just draw on the image to accomplish this. If you want to customize the color, thickness or tip of the pen then click on the down arrow next to the pen and then click on the Customize drop down choice. Once you have the changes you want you can then select Custom Pen to use your changes for document markup. Capturing multiple active windows or one screen of a multiple screen setup did not seem possible unless you knew about Microsoft’s Snipping Tool, so now you know.